So the first week of setting goals didn't go as well as I would have liked and I blame this mostly on the fact that I still haven't kicked the stomach flu that I managed to pick up last Friday. I keep thinking I'm better and then I get hit again... aka not a lot of work got done this week. Let's see what did get accomplished though. Goal #1: Prime trim: Finished! Not great, but not horrible considering. So my goals for this week are to finish these up and to get the ceiling trim up. What ceiling trim you ask? 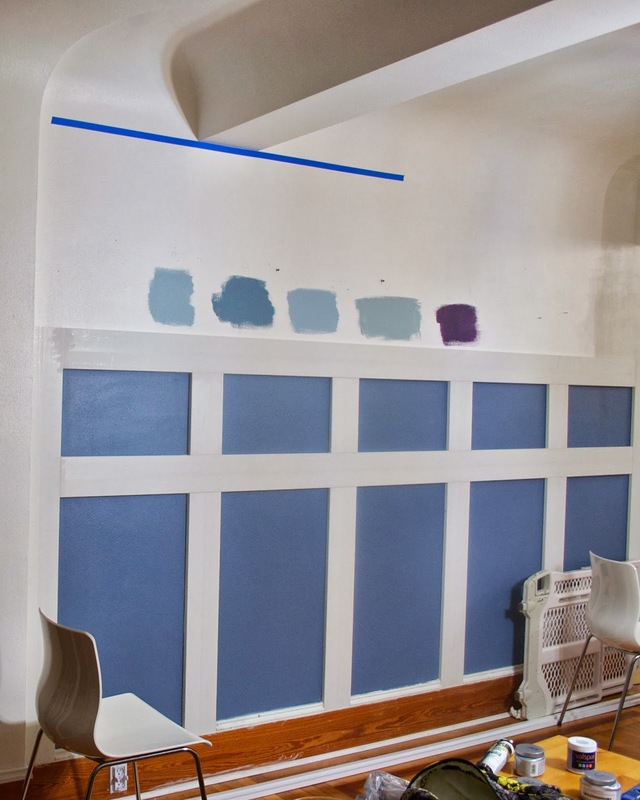 Well after much deliberation, we finally landed on the idea of using trim as a stopping point for paint when painting our coved walls. This solved the issue of when to stop and it adds a little extra detail in the room. To make sure we keep everything level in the room, we used a laser level to mark off where the trim would go to see if we liked the idea. You can't see the laser line but we left it going for a while just so we could glance up every once in awhile and see if we still liked the idea. We did, so it was time for paint. We used this wall as our test wall since it was a small part of the room and if we didn't like it, it wouldn't take much to redo. So lets talk paint for a sec. You can see we had a bunch of colors, mostly in the bluish range, we were choosing from. After putting samples up all around the room, we didn't love any of the bluish options. The hardest thing was our couch. It is technically grey but has a greenish-blue undertone to it that seemed to fight with all the blue options. As a little bit of a joke, I suggested purple but Nate was on board so I through up samples of purple from a quart of paint we had for another project. 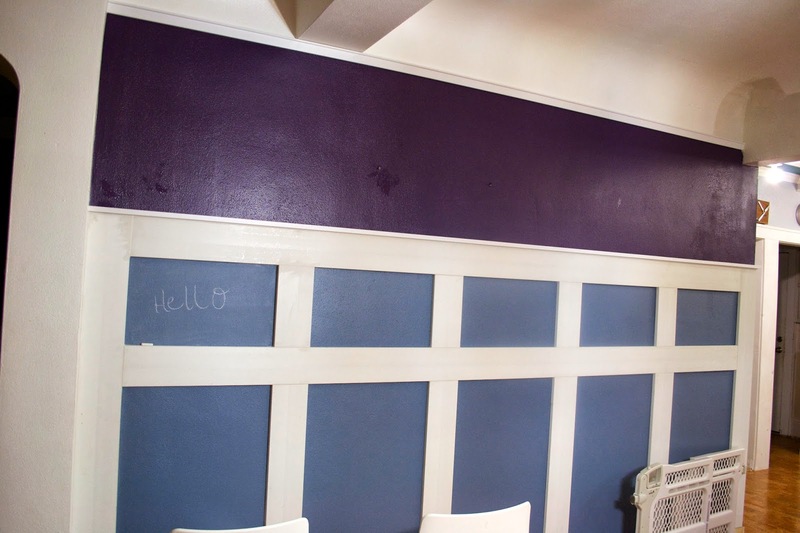 Now purple is bold, but we loved it and since the rest of the downstairs is grey, it doesn't feel like a huge amount of color. 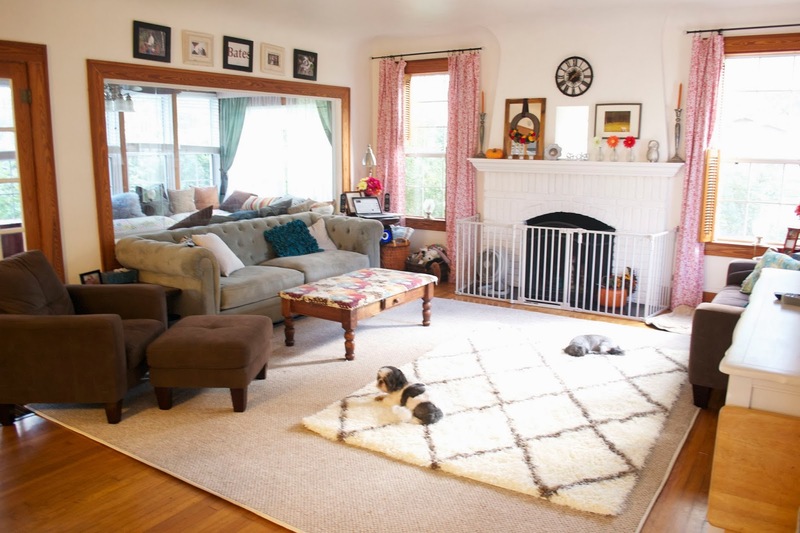 The other thing that swayed us to the purple is that there is very little wall space in this room because of all the windows so we're hoping it feels more like an accent. After about three coats of paint, we were able to install the top piece of trim and we were on our way to painting the room! We'll have better pics for you of the room once everything is painted but for now we are loving having some of the paint up.